I had a 3 days trip to Bangkok at the end of March 2004. I purposely selected a weekend trip as I would like to visit the famous Chatuchak weekend market - one of the largest flea market in the world and opens during weekend only. You can find almost everything you want in Chatuchak. Shopping at Chaktuchak you had better wear as less as possible because there is very very crowded and hot. Spent almost 4 hours over there, I brought quite a lot of favourites, very heavy, but still would like to keep shopping. However, it was too tired for me going on so I took a little rest at a cafe inside Chaktuchak. 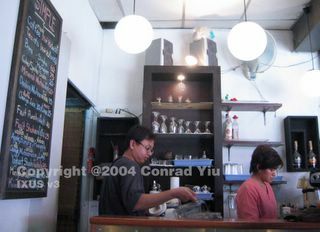 It was a very nice cafe, especially the shopkeepers. They served cool drinks which made me feel great refresh. Though the picture was not a good shot but I like it (cafe)!